KIBRA is a signal transducer protein, mainly expressed in the kidney and brain. A single-nucleotide polymorphism (SNP rs17070145, T → C exchange) has been linked to different cognitive function. In 2008, we studied 70 subjects who complained of subjective cognitive decline (SCD) and found that CT/TT carriers performed worse than CC carriers on a long-term memory test. We followed up the 70 SCD subjects and also 31 subjects affected by mild cognitive impairment (MCI) for a mean follow-up time of 7 years, during which 16 SCD subjects progressed to MCI and 14 MCI subjects progressed to Alzheimer’s disease (AD). Carrying the T allele was associated with MCI and with a two times-higher risk of developing MCI than CC carriers. In the SCD sample, CT/TT carriers showed a greater worsening on Rivermead Behavioral Memory Test (RBMT) compared to CC carriers. In the MCI sample, CT/TT carriers performed worse than CC carriers on RBMT. There is a lack of consensus on the effect of KIBRA gene variants on cognitive performances in episodic memory and on the risk of AD. Our results confirm a role of T allele on progression of cognitive decline. Salvatore Mazzeo and Valentina Bessi contributed equally to this work. The online version of this article ( https://doi.org/10.1007/s10072-019-03866-8) contains supplementary material, which is available to authorized users. This research was funded by Ministero della Salute and Regione Toscana (grant nos. 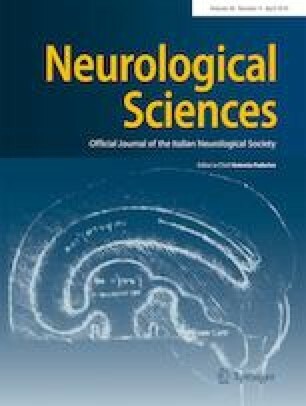 GR-2010-2316359-Longitudinal clinical-neuropsychological study of subjective memory complaints) and Fondi Ricerca UNIFI 2018. All procedures involving experiments on human subjects have been done in accordance with the ethical standards of the Committee on Human Experimentation of the institution in which the experiments were done or in accordance with the Helsinki Declaration of 1975. Specific national laws have been observed.